New Avatars of Oats and Ragi! There is lot of health buzz about these super foods Ragi and Oats everywhere you go. Few brands claim that there product is made with natural ingredient s like ragi and oats. My concern is why should we shell of money on these products like biscuits chips and breakfast cereals just because they have these ingredients in it. These additions can be done by anyone in our daily homemade food with different variations in our menu. So I thought let me share few easy and healthy variations in your daily foods with these super nutritious cereals Ragi and Oats. Sensible ways to eat Ragi! • Ragi masala porridge made by boiling Ragi in water mixing curd, jeera powder, coriander and small piece of ginger can make a delicious and healthy breakfast. • Roasted ragi flour mixed with milk, jaggery and peanuts can turn out to be a yummy ragi balls that can be a great snack. • Ragi flour can be mixed in your regular dough for rotis. • Dosa and idly made with ragi flour can a nutritious breakfast. • Sprouted Ragi grains can become your favorite ingredient in your daily salads. • Our common Indian desserts like halwa and burfis can be made with ragi milk. Sensible ways to eat Oats! • Oats can be used as an alternate to bread crumbs to coat your chicken, fish or cutlets. • The simplest way to eat oats is to eat it dry as snack. You can add some almond and raisins to make it delicious. • You can make your boring oats porridge tasty by adding some of your favorite fruits to it. It gives your regular oats a slight twist. • You can use salads and chaats a crisp feeling by using oats as a topping. • Instead of eating oats just mixed with hot water, mix it with low fat curd and add your favorite fruit pulp or cut fruits to it. It gives your oats a different flavor altogether, just relish it! • Mix vegetables like onion, tomatoes, capsicum, carrot, cucumber to a cup of oats and sprinkle your favorite spices. A nutritious and yummy oats bhel is ready just for you! 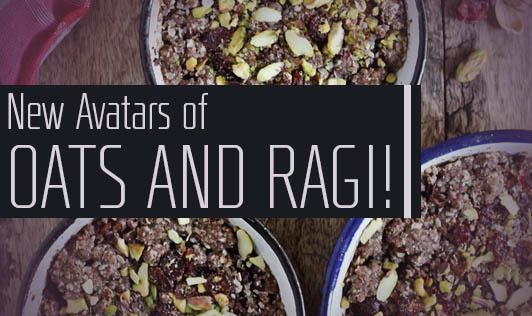 Do you know any other ways to make oats or ragi interesting? You can share with us..